Older homes may have a central vacuum that doesn't seem to have the power or proper tools to clean well. In fact, the central vacuum may not be getting used at all. Fortunately, the internal piping system and wall plates are almost all universal. That's where we step in and upgrade your system with a more powerful vacuum unit and a new, efficient hose and tools. 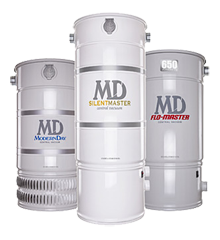 We'd love to show you some of the amazing new central vacuum options from MD Manufacturing. Give us a call today before you head out to buy a regular vacuum. You will be amazed at the cost and results of using your built-in central vacuum system!